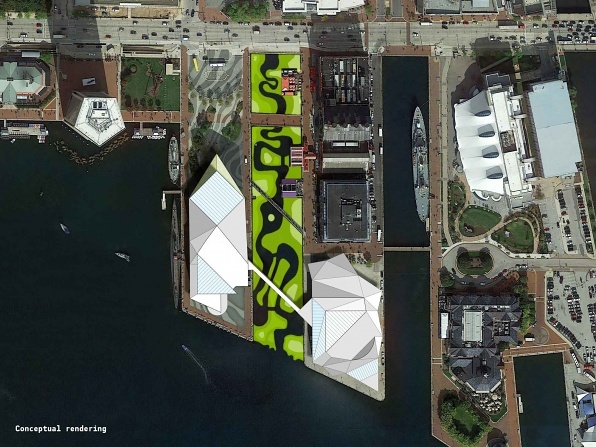 First, the aquarium’s Marine Mammal Pavilion on Inner Harbor Pier 4 would become an attraction focusing on the “Chesapeake Bay Watershed,” if-and-when the aquarium’s dolphins are no longer in residence. Aquarium chief executive John Racanelli disclosed in 2014 that the aquarium is studying the possibility of no longer exhibiting its eight Atlantic bottlenose dolphins at the Inner Harbor, adding to a national discussion about the ethics of keeping cetaceans in captivity. 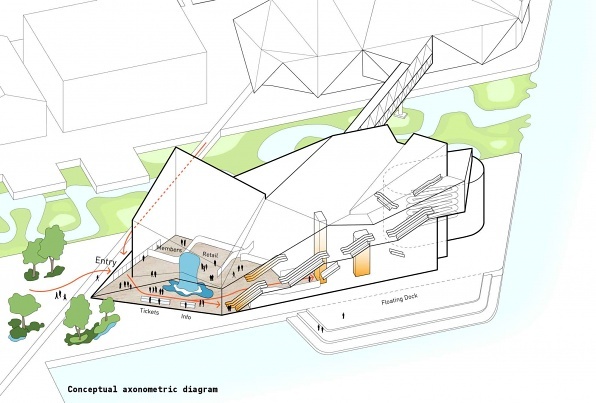 Second, the aquarium’s original building on Inner Harbor Pier 3 would be redesigned to offer “an expansive tour of global ‘Hope Spots,’ treasured places on the planet that are worth protecting,” and given a new circulation system visible on the building’s exterior. This would be a new and more conservation-oriented visitor experience inside the 1981 building, whose exhibits were designed to take visitors on a simulated journey around the world, from beneath the ocean to the top of the Amazon Rain Forest. 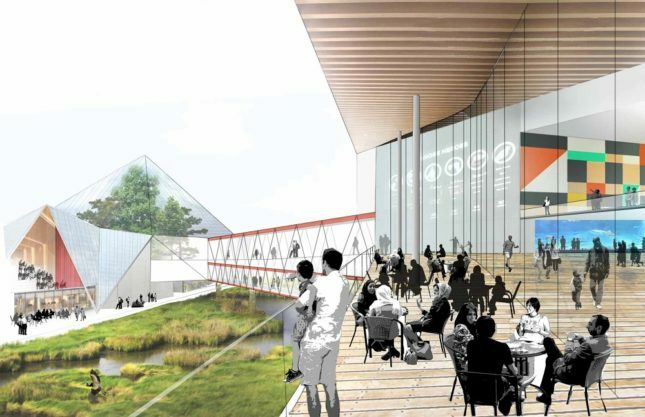 By providing outdoor educational and social spaces for visitors and the public, designers say, the wetlands project “simultaneously improves the local ecology, creates a campus identity, strengthens connectivity, and extends the aquarium’s growing conservation work in the region.” Both of the existing buildings, including one of the first major aquarium structures by Peter Chermayeff and his colleagues at Cambridge Seven Associates, would be retained under Gang’s proposal. On Pier 4, the Marine Mammal Pavilion, designed by GWWO of Baltimore and opened in 1990, would receive a similarly thorough makeover, with changes designed to reuse much of the existing building yet give it a new architectural identity to coincide with its new use and unite “existing and new building volumes” on both piers. The transformation is the culmination of a two year long design process that Gang led in her first project in Baltimore and one of her first on the East Coast. Studio Gang was hired by the aquarium along with a predictive intelligence company, IMPACTS Research & Development. 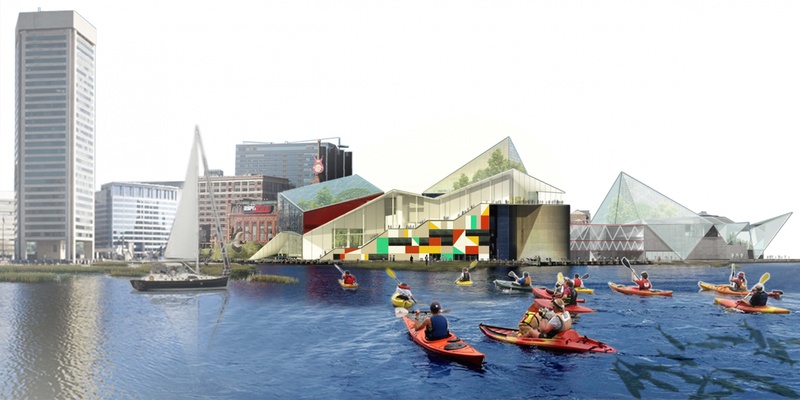 Drawings, renderings and an explanatory text have been posted on the Studio Gang website, which calls the project the “National Aquarium Strategic Master Plan” and says design work was completed in 2015. 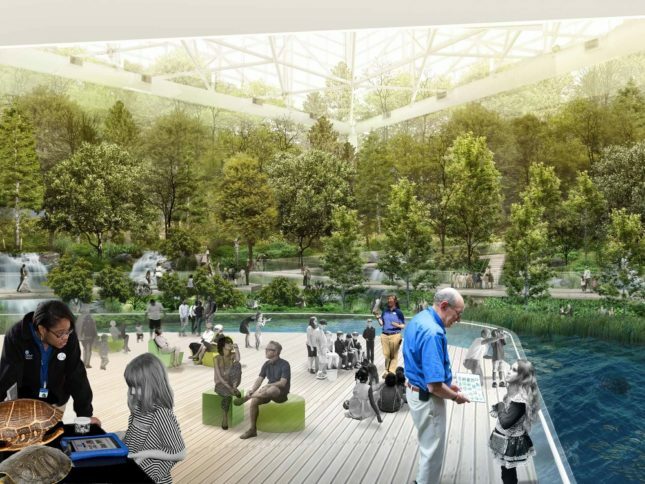 The plans call for the aquarium eventually to contain 360,000 square feet of indoor space and a 37,000 square foot urban wetland. 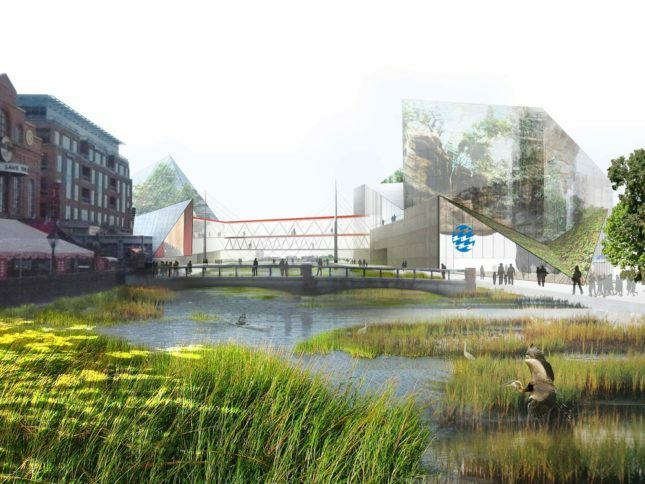 Coordinating the architectural experience with the exhibits and education spaces, the proposed design for Pier 4 takes visitors on a journey through the various ecological zones of the Chesapeake Bay watershed, the largest estuary in the United States and one of the most fragile. 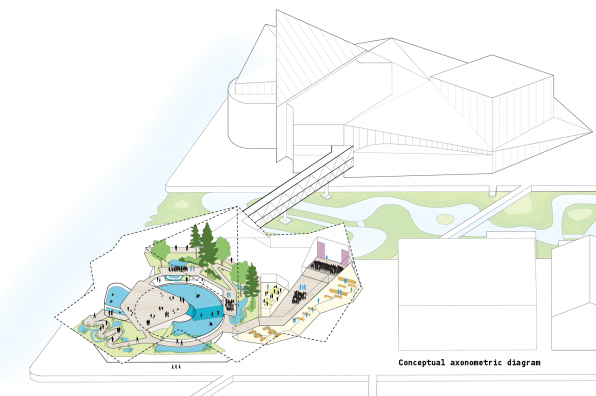 Educational labs and classrooms are integrated within both interior and exterior exhibits and enable visitors to see back-of-house functions such as a “fish kitchen.” Under Gang’s plan, the new program areas are closely tied to the aquarium’s conservation work. Aquarium officials have not said for sure when or whether they are discontinuing their popular dolphin exhibit. They have said they plan to carry out the strategic plan recommendations in phases, as funding allows. 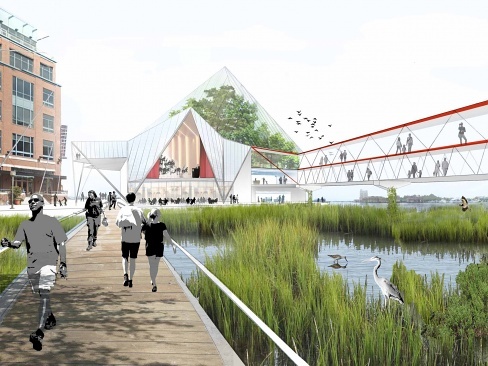 The first major project they are launching is the urban wetlands and changes to outdoor spaces on Piers 3 and 4. That project is currently going through the local design review process, with Ayers Saint Gross of Baltimore as the lead designer.